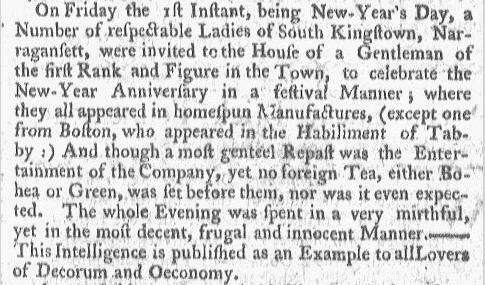 January 11, 1768: The Boston Gazette, and Country Journal published an account of the New Year’s celebration of a Number of respectable Ladies of South Kingstown, Naragansett. This entry was posted in Old News and tagged Boston Tea Party, Colonial Boston, Holidays, New Year, Taxes. Bookmark the permalink.